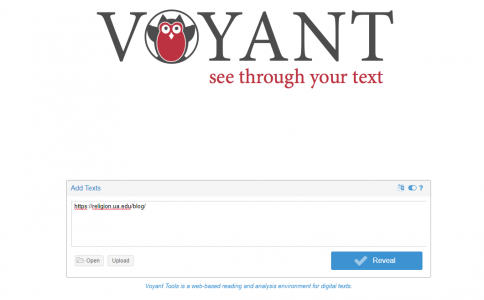 Voyant Tools allows you to read web pages. 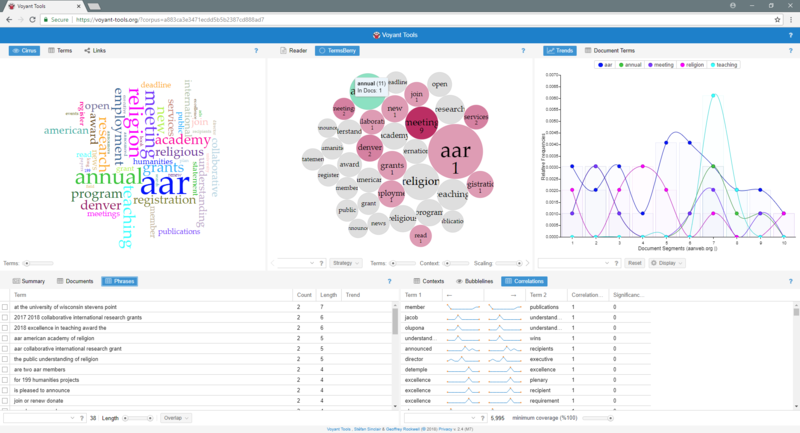 Voyant helps you do analysis of sites, too. The kind of reading done by Voyant might be called “scraping,” which covers activities such as text analysis, statistical analysis, and data mining. In order words, Voyant may help you pull things out from a site more quickly than you would by spending days reading hundreds of web pages associated with a particular URL. The graduate students who take REL 502 at the department likely hear about it from Dr. Altman and use Voyant before their semesters end. I was reminded of this powerful tool during a workshop at the 2018 Digital Pedagogy Lab. The facilitator, Lee Skallerup-Bessette, used Voyant to analyze the data provided to her by the participants during registration. All she did was present a word cloud. I immediately thought: what would happen if I dropped in the URL for the department’s blog? Hmm… I hit the “reveal” button. In the upper left corner is a word cloud that graphically represents the most frequently mentioned words on the site. There is a slider in that frame that allows me to change the number of words from one to 500. The upper middle frame is a reader that analyzes the most recent blog post on the site. If I hover my cursor over any given word, I am told how many times that word appears in that particular web page. If I click “TermsBerry,” I am given a graphic representation of the terms. 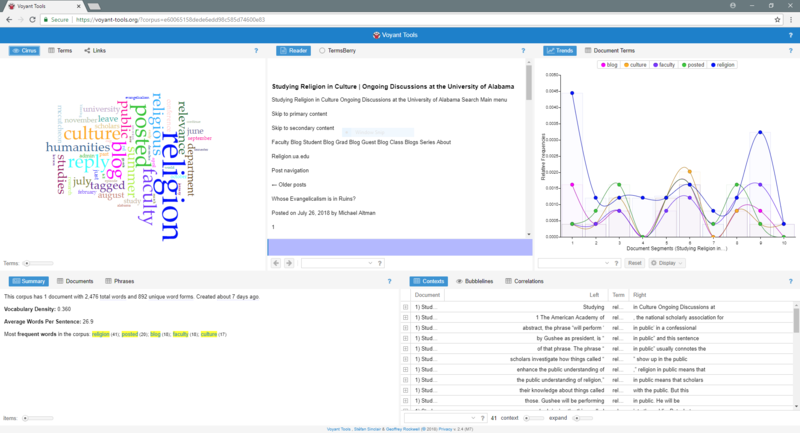 The upper right panel shows an analysis of trends in the terms used across the entire website. And, just like the other two, I can adjust the number of terms displayed in the analysis as well as their graphical representation. 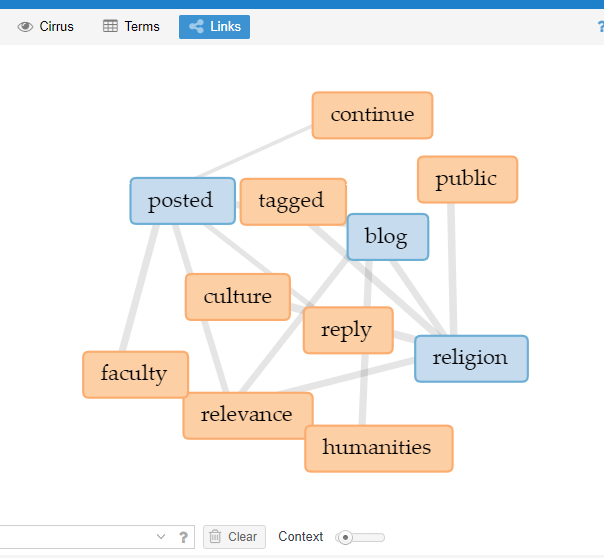 Then, if I head back to the upper left corner and click on “link,” I am shown a graphic representation of words used on the site and their likely relationships of logical dependency. While the authors and webmasters for a site may have different ideas of these relationships in their minds, the tool is useful for considering what is presented to other users. OK, so what is significant or useful about Voyant Tools? The examples of what to do with this tool are numerous. The platform was discussed last year on UA’s Teaching Hub. Voyant can be used either as a place to start thinking about terms and their relationships, or it can be used to test hypotheses. Voyant might be used to zero in on a particular set of terms, too. The most important item to consider is creating what is called a “stopword list.” Voyant alread screens out words such as “the,” since it is not necessarily a term you want to analyze. With the department blog, a reader might have additional stopwords for the list. Notice how I used the term “reader” in the previous sentence? That’s the point of Voyant Tools. It can be helpful for reading across an entire website. Rather than reading possibly thousands of pages across a site, Voyant can provide the means to quickly scrape up some data to help focus your reading of any given website. Nathan Loewen is an Assistant Professor in the Department of Religious Studies and Faculty Technology Liaison for the College of Arts & Sciences. This post originally appeared on the Studying Religion in Culture blog.